How do I replace an IPXQ Power Supply on my Mini? This procedure details steps to replacing the IPXQ power supply in the Legend Mini 18 and 24. Before starting on this procedure, unplug the power cord from the machine. Remove the four p-loops with a 5/16 nut driver. Note: There is a black and red lead in the top left of the machine. Do not disconnect this lead. Only three leads should be disconnected for this procedure. Replace the IXPQ battery with a new IXPQ battery. The new battery is identical to the old battery. 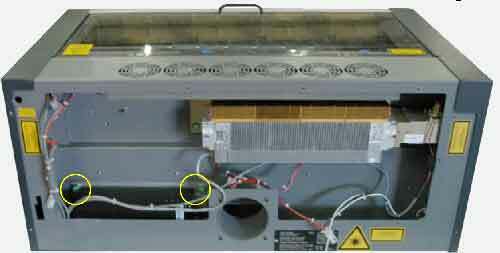 Therefore, sit the battery just like the old battery, with the green captive screws on top. Screw in the green captive screws. Reconnect the connector with the green with yellow stripe, black, and white lead. There are two leads containing these wires, connect only the longer of the two. Reconnect the two connectors holding the red and black leads. The longer of the leads goes to the farthest left connector. 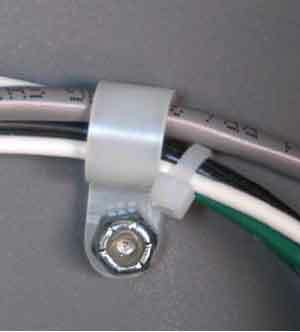 The shorter lead connects to the lead from the laser tube. Tuck the wires into the machine and replace the back service panel.